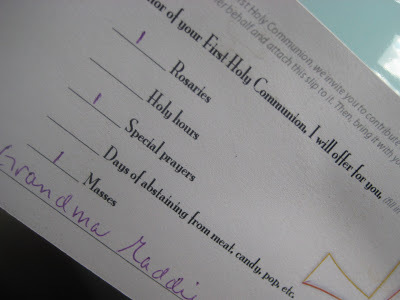 With each invitation we sent out, we (secretly) included a little card asking guests to join us in giving our daughter a spiritual bouquet for her First Holy Communion. They could check off what prayers they would like to offer for her. 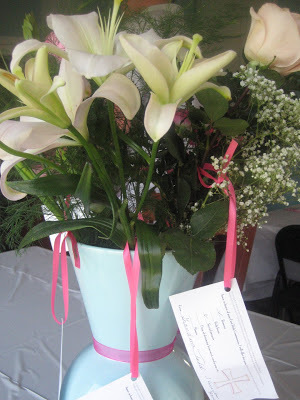 And then, we asked them to bring the card, attached to a special flower, to our celebration afterward. It was so beautiful to see the bouquet grow, with all of the different hand-selected stems! And all of the prayers she is receiving are so appreciative! Long after the flowers have wilted away (there are only a few remaining today), she will be able to keep the prayer-cards with her other special First Communion items, and know and feel just how loved she is through the power and beauty of prayer. this a lovely idea. i'm so glad you shared it the first communion joy link party. i'm sure many mom's will adopt this simple practice. 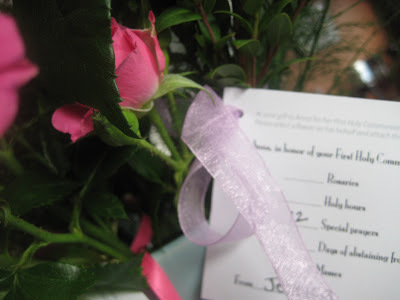 how beautiful…i do agree…this was a lovely, thoughtful idea! you are such a dear mama, sarah!